Brand new for 2016! Our hand painted talavera garden pottery is popular because of it's bold colors and high gloss finish. 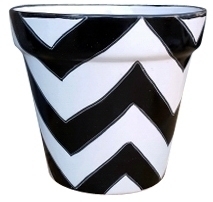 These pots are a new unique pattern called Chevron. With it's bold slashes of bright colors they are fun & beautiful. Contemporary or traditional this pattern works with both. Group them together for a wonderful display of flowers, topiary, houseplants or bushes. Place on a patio, front porch or garden table. Indoors or Outdoors. We recommend if using outdoors you cover the pot with furniture wax to reduce crazing.